I was a boy when I first heard one of the legends behind pasta puttanesca. Dom DeLuise was the guest host on the Mike Douglas Show and he told the tale while he prepared the dish. It has to do with the “ladies of the evening” of Naples and the strength of their perfume. I don’t know whether it was the pasta or the tale but I remember both to this day. A variation of the story is that these same ladies used the sauce’s aroma to lure gentlemen callers into their parlors. I’m sure that there are other legends about this sauce’s origins and I’m equally sure that they all involve its strong aroma. Once you’ve prepared a puttanesca sauce, you’ll know exactly what I mean. Virtually all puttanesca sauces rely principally upon 5 basic ingredients: tomatoes, anchovies, red pepper flakes, garlic, and olives. I prefer a sauce with some texture so I’ll use crushed, diced, or whole tomatoes that I’ve mashed with my spoon. This recipe may call for 6 anchovies but I’ll very often use the entire tin, unless there’s a Caesar salad in my immediate future. Although most recipes call for pitted, black olives, I’ve found that the addition of a couple large, green olives adds another flavor into the mix. The purchase of a small container of mixed olives at my grocery’s deli counter works perfectly. Speaking of olives, they, along with the anchovies and capers, can be pretty salty. Be sure to taste the sauce before seasoning with salt and do so at the very end of cooking. Now, whether you find yourself in Italy or in an Italian restaurant here in the States, it is frowned upon to use grated cheese of any kind on a pasta dish made with seafood. As such, there are many who will say that a puttanesca sauce starts with anchovies and, therefore, cheese must not be used. Others are willing to bend the rules since the anchovies are not the “star” of the dish as, say, clams might be in a different recipe. To cheese or not to cheese? The answer to that question will be left entirely up to you. I know a minefield when I see one. Add oil to a large, deep fry pan and heat over a medium-high heat. Add pepper flakes & anchovies and cook for 2 minutes. Use the back of a wooden spoon to stir & mash the anchovies until they disintegrate into the oil. Add onion and sauté until onions are translucent, 8 to 10 minutes. Add garlic & parsley and sauté for 1 minute. Add tomato paste and continue sautéing for about 2 minutes. Add tomatoes, stir to thoroughly combine, bring to boil, and reduce to a simmer. After 30 minutes, add olives and continue simmering. After 10 minutes, add capers and 2 tbsp basil, stir to combine. Taste before seasoning with salt and pepper. Add drained pasta to the pan, stir to coat with the sauce, and continue cooking until pasta is al dente, 1 to 2 minutes. Serve immediately, garnished with remaining tsp basil. This sauce is cooked relatively quickly and features bold flavors. To add another dimension, try using fresh tomatoes that have been picked in the height of the season. I usually use 10 to 12 ripe plum tomatoes that I’ve peeled after blanching them in boiling water for about a minute. Once peeled, chop and, if you like, seed the tomatoes before adding to the pan. The fresh tomatoes, anchovies, and olives combine to make one spectacular dish! Like many of my tomato-based sauces, this one calls for a large can of tomatoes. Truth be told, I rarely use canned tomatoes. Mid-August, I start buying half-bushels of plum tomatoes at my area’s farmers’ markets. After washing, some are blanched, peeled, chopped, and then frozen in quart containers. The rest are run through my Roma strainer before being frozen. I try to freeze at least 45 quarts and that will ensure that I’ll have enough tomatoes to easily last through Spring. When the time comes to use them, depending upon the sauce I’m preparing, I can choose between the chopped or strained quarts, or, I can combine them. Best of all, there are no more trips to the grocery store for a can of tomatoes, only to return with 2 bags full of impulse buys. 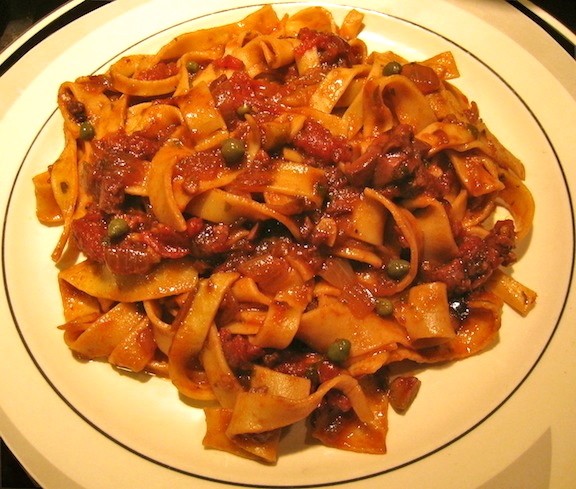 This entry was posted in Pasta/Rice/Soups (Primi Piatti), Sauce/Gravy (Ragù/Sugo), Vegetarian and tagged Cooking, Food, Italian, Pasta, Recipes, Tomato Sauce by ChgoJohn. Bookmark the permalink. Thank you, Judy. This is one of my favorite sauces. 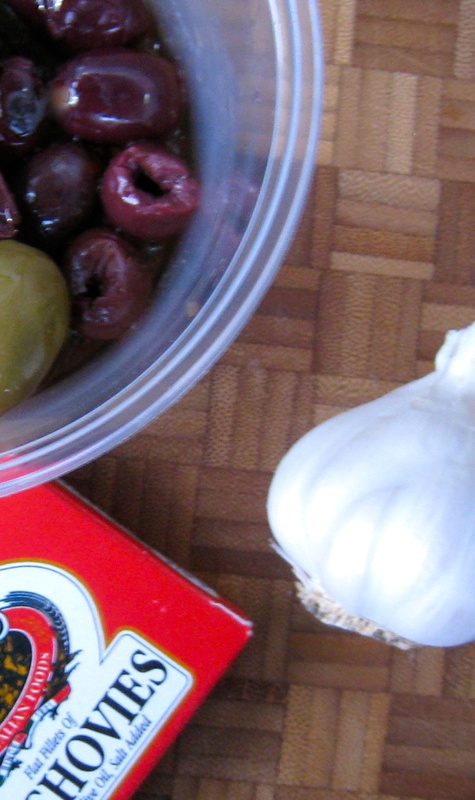 The anchovies and olives combine to give it such great flavor. This is one tomato sauce where the tomatoes actually take a back seat to the sauce’s other flavors. This is one of my favorite pasta dishes! I always use the entire can of anchovies, and I add them after I sauté the onions (I add them with the garlic, your Step 3). Although I see a lot of recipes that specify spaghetti for this dish, I prefer a much more substantial shape, as it appears you do (judging form the photo). I know cheese is frowned upon because of the anchovies, but this dish really benefits from a hit of cheese, IMO. Good post – thanks. Thanks, John, and to be honest, I’m much more likely to add the entire tin of anchovies to the pot — after tasting one “for freshness”. It certainly spares you trying to store or use them in something else. You’re right about the cheese but this is such a strongly flavored dish that a little cheese wouldn’t hurt at all. I wouldn’t necessarily do it in Naples but at home? Why not? Thank, John, for sharing your methods and commenting. This recipe turned out perfectly! I love this dish and had never made it before, I followed the recipe and everyone loved it. Thank you. I am so glad that you all enjoyed the recipe. It is a very flavorful sauce with an incredible aroma, to boot! Thank you for taking the time to come back here and leave such a great comment.